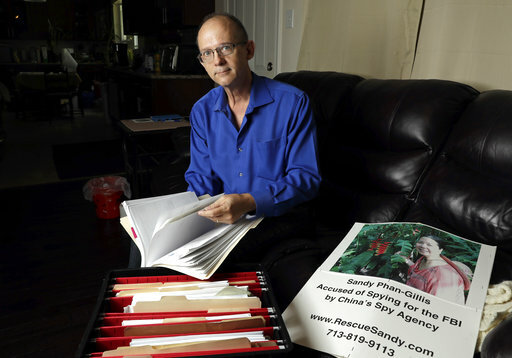 HOUSTON (AP) — An American woman detained during a business trip to China and charged with spying was sentenced Tuesday to 3 ½ years in prison, raising the possibility that she may be allowed to return home soon. Phan Phan-Gillis has faced an uncertain fate since March 2015, when she disappeared from her group traveling in southern China. She was later accused of espionage, which carries a possible death sentence. A United Nations panel has said her detention violated international norms, and the U.S. has long pressed China to resolve the case fairly. The U.S. State Department confirmed that she had been sentenced Tuesday. While Phan-Gillis’ trial was closed to the public, a representative from the American consulate in Guangzhou, China, was allowed to attend the public announcement of the verdict against her, the State Department said. The Chinese embassy in Washington did not respond to a message about her case. Phan-Gillis is of Chinese descent, but was born in Vietnam and is an American citizen who lived in Houston and worked as a business consultant. Known by friends as “Sandy,” she made numerous trips to China for business and as a volunteer to promote cultural and business exchanges. She disappeared from the rest of her group during a trip in March 2015 to promote business opportunities in Houston. It took her husband, Jeff Gillis, almost two weeks to confirm through American consular officials that she had been detained by Chinese state security. The Dui Hua Foundation said Phan-Gillis was the first American citizen to be convicted of spying in a Chinese court since 1973. But Phan-Gillis’ 3 ½-year prison term is on the low end of sentences for espionage charges, according to Dui Hua’s research. China sometimes releases foreigners as an apparent sign of goodwill. Last year it allowed Kevin Garratt, a Canadian citizen held for two years and accused of spying, to return home after Canadian Prime Minister Justin Trudeau mentioned Garratt to top officials in Beijing. In Phan-Gillis’ case, Kamm credited the Trump administration and particularly Secretary of State Rex Tillerson, who visited Beijing last month. Kamm said he was told by “people who were in the room” that Tillerson pressed Phan-Gillis’ case in private meetings. “If U.S.-China relations were not going as well as they are right now, I think this outcome would have been different,” Kamm said.